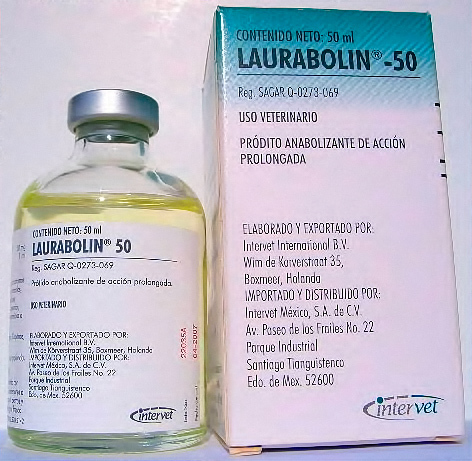 Laurabolin is an injectable veterinary steroid containing the drug nandrolone laurate. Nandrolone laurate is basically a long acting Deca Durabolin, staying active for up to a month in the body. Athletes however generally inject this drug on a weekly basis. Being a nandrolone, Laurabolin will exhibit noticeable anabolic effects with weaker androgenic side effects. Although many women do use nandrolones, Laurabolin may be one to avoid. Androgenic effects can appear in women with nandrolones, especially if blood levels were to build up too high with such a long acting drug. Durabolin would be a better choice. For men, doses of 200-400mg per week seem to work fine. At a strength of 50mg it is difficult to use a much higher dose, although some do find it possible. The Mexican Intervet product is found throughout the United States and usually sells for a fair price. It comes in 50ml vials, 50mg per ml. Recently Intervet has changed their packaging. 25mg or 50mg per cc 50 cc/vial. This is a veterinarian steroid found primarily in canada and Europe. It can be thought of a very long acting version of Deca. Whereas Deca can stay active in the system for two weeks, this product is usually active from three to four. The bad thing about Nandrabolin is that it is only available in low milligram doses. This product is presently not being counterfeited and is cheap. Order Laurabolin and other muscle enhancing drugs! Laurabolin is oil based injectable steroid, which was intended for veterinary use in animals such as cats, dogs, pigs, lambs and horses. For the life of me, however, I can´t imagine a doctor prescribing steroids for someone´s cat. As with many useful steroids, Laurabolin was never approved or marketed towards humans in the USA. Firstly, this compound is a 19-nor-testosterone based steroid, and specifically, a Nandrolone, which means that nearly anything which is true of Deca-Durabolin (or any other Nandrolone), will be true of Laurabolin. We´re talking here about positive effects on joints, collagen, and bone-mineral content (1)(2). And we´re also talking about the unfortunate progestinic effects that Nandrolones (remember, Nandrolone is a progestin) have. Progestins have the unfortunate ability to wreak havoc with your natural hormone levels, as well as amplifying many of estrogen´s effects. (5) Don´t forget to have on hand an anti-progestenic ancillary drug. Personally, if I was going to run any form of Nandrolone, I´d be using Letrozole at .5mg/day. While it´s true that Letrozole can cause some problems with blood lipids, I think that when you consider the positive effects that Nandrolone has on them (6), you´ll find that they can both be run together safely, and actually provide a many complimentary actions. Letrozole will also help you with any possible estrogenic effects from Laurabolin (more on this later). Also, in a cycle containing Laurabolin, testosterone is going to probably be necessary for most people, as you´ll want to replace the testosterone levels which Laurabolin´s progestenic properties will have depleted you of. A good rule is to use roughly equal amounts of both compounds. Laurabolin has a strong anabolic action with minimal androgenic properties and was specifically designed to promote Protein Synthesis without the production of undesired (side) effects. This cellular protein synthesis allows the prevention of protein loss through the urea and promotes lean tissue build up. In animals this compound has also been used to correct metabolic deficiencies, malnutrition, anemia and slow maturation (8). A Few other characteristics of Laurabolin are maintenance of proper levels of Calcium & Phosphorous, and production of red blood cells (8). This compound is unlikely to be counterfeited, due to its low demand in the Nandrolone market-place, where Deca and NPP are the reigning champs. Also, Laurabolin is mostly available in Mexico, where it is sold in very low concentrations; wheras Deca and NPP are available from several Underground Labs, as well as major pharmaceutical houses. So what will it do? Basically, as stated previously, Laurabolin will do everything Deca will do. This stuff will help you recover more quickly from exercise (3) via replenishing muscle glycogen; increasing protein synthesis, etc& the only true difference is the duration of its effectiveness. Laurabolin can remain effective for up to many days after the injection, but only slightly more than Deca. Nandrolone´s structure is very similar to that of testosterone. The only difference if it lacks carbon atom the 19th position, this causes it to have much lower androgenic properties then testosterone. The primary reason for low androgenic side effects associated with Nandrolone is that although it is altered by 5a-reductase enzyme just like testosterone, the altered product is dihydronandrolone which is much weaker in action then dihydrotestosterone. What do all of these big words mean to you? Well& None of them are particularly important& they´re just geek-speak for stating that nandrolone generally produces less side effects than testosterone. The gains with this compound are much slower then with testosterone, however they are of higher quality and are easier to maintain once the use of Laurabolin has been discontinued. And of course, as with any Nandrolone, proper Post Cycle Therapy regimen should be incorporated at the end of cycles consisting of Laurabolin. It will, again, like all nandrolones, increase your bodymass, FFM, and strength (7). The average doses for male athletes are in the range of 200-400mg per week (which would entail putting more oil in your body than there is in your average Indy 500 car). Female athletes can also find this item useful as it has low androgenic properties and high anabolic properties, which will limit virilizing effects (effects which make a woman take on male characteristics). The average dose for a female athlete would be in the range of 50-100mg per week. Laurabolin is a good choice for female athletes, as it is usually sold in a very low concentration (Mg/Ml), is rarely counterfeited, and is not in high demand, and thus is cheap (you should never pay more than $2-4 per ml). Sadly, this drug will never really be very useful for men, except perhaps for its effects on bone mineral content and collagen, which can be had at 50mgs/week, because it is only available in low dosed concentrations. Formula (ester): C12 H24 O2. Laurabolin 50 - will exhibit noticeable anabolic effects with weaker androgenic side effects. Although many women do use nandrolones, Laurabolin may be one to avoid. Androgenic effects can appear in women with nandrolones, especially if blood levels were to build up too high with such a long acting drug. Durabolin would be a better choice. For men, doses of 400-500mg per week provide excellent results for strength increase and gains in lean mass. The Intervet product is made in Holland and it is made available in 10 ml and 50ml vials, 50mg per ml. It can be thought of as a very long acting version of Deca Durabolin and is a high quality medicine. Whereas Deca can stay active in the system for two weeks, Laurabolin is usually active in the blood for up to four weeks.